I've just recently come back from a round-the-world holiday (which was blogged about here) and of course I had a travel laptop with me the whole time. Being security aware and generally a little paranoid about people getting access to my data I took a few precautions before leaving for this vacation. Here are six must do tips that any traveller with a laptop should follow before setting foot at the airport. This article is in context of the laptop I used (Lenovo Ideapad 100S with upgraded SSD storage), however each of these tips would be applicable to practically any laptop (as long as it's running Windows). Pro tip - don't take your Mac on vacation. This one should be obvious, your password controls access to your account and without it you can't login and use the laptop. This does not protect your data but does make it a little bit more difficult for any would-be thief to run off with your laptop and make use of it without any effort. Windows Updates are like a bad rash sometimes but they do fix security issues and bugs that could be exploited to gain access to your laptop. Having a most up-to-date system before travelling is a must especially if you are going to be accessing free WiFi (and trust me you will be). If left unpatched security bugs can be used against you on unsecured networks, so to avoid any incidents it is best to do an update. A password manager can store all of your passwords safely and securely with encryption and protection of a master password. This way you only have to remember the master password to unlock any of your other passwords. In itself a password manager will not secure your laptop but if you get into the practice of having different passwords for each of your accounts on various web sites and you store these in a password manager, your web presence while travelling will be more secure. I personally have been using Dashlane for this purpose for a number of years but there are many choices like 1Password, KeePass, LastPass, etc. Unless your laptop came with Windows 10 Professional you would not have access to BitLocker. 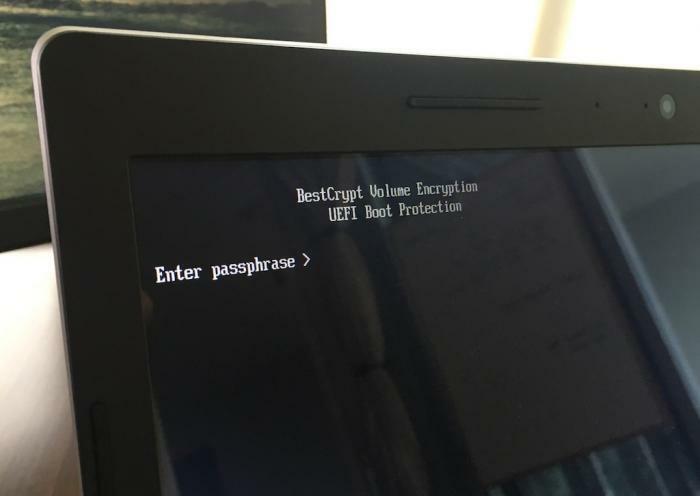 I searched around for the best possible solution to hard disk encryption for quite some time before settling on BestCrypt. The product is not free but for the cost of around $99USD it is worth it many times over. With BestCrypt you can encrypt your entire hard drive. Each time the laptop is started you will be prompted to enter a password to unlock the disk even before Windows starts. This means that even if your laptop or hard disk is stolen, the data on it will be encrypted and secure. Without the encryption password none of the files can be accessed. Together with password protecting your account, doing a full disk encryption is of critical importance. This should really be a standard part of any Windows installation so it goes without saying that while travelling that a virus scanner becomes essential. Even more so if you're using unsecured and unknown free WiFi networks. The last thing you want while on holiday is to deal with a virus infected laptop. I went for a free virus scanner - Avast, but any virus scanner would work just as well. The other notable free scanner is AVG. Prey is an app that can be used to track the location of your devices. You can use it for free for a limited number of devices. 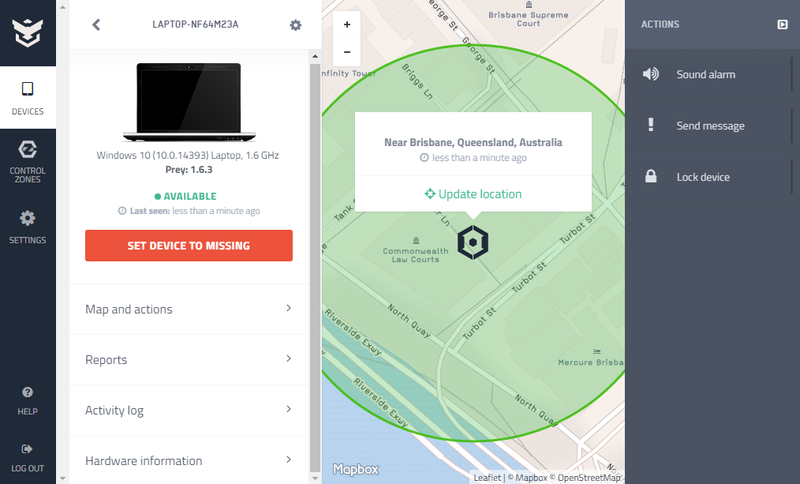 So in the unfortunate event if your laptop goes missing you can track down where it is. You can also make the laptop sound an alarm or display messages (assuming it's turned on and connected to the Internet). If you pay for a Prey account you can also use it to wipe your device remotely. That pretty much sums it up. Physical security of your laptop is also important but that's outside of the scope of this article.